One of the highlights of the RHS Flower Show Tatton Park (19th to 23rd July 2017) is the Royal Horticultural Society (RHS) Young Designer Competition. This year marks its ninth year and the success of the competition in inspiring a hub of young horticultural talent. The competition gives aspiring garden designers, aged 28 years and under, the chance to launch their careers and gain exposure at a prestigious RHS Flower Show. 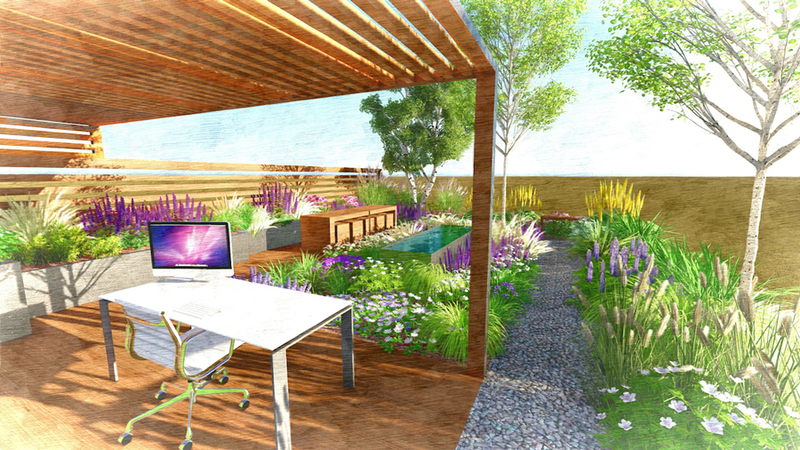 Inspired by ever increasing working hours and the creative and mindful benefits of green spaces, this year three finalists have been selected to design a show garden demonstrating what the fusion of garden and office means to them. 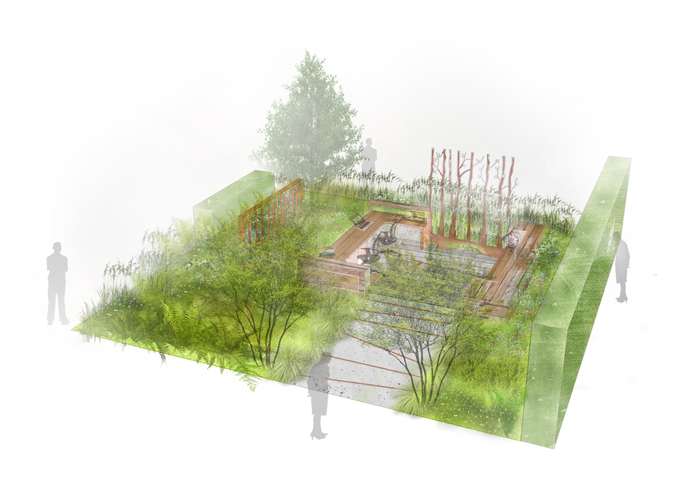 The inspiration for the three young designers will be the idea of using gardens as a workspace, whether as a practical or quiet space, a place to hold meetings or a space within an urban setting. Anca Panait (27) is from Glasgow and has created a working environment connecting the standard office with the outdoors to provide a space for observation and privacy. The woodland-style planting of ‘Prospect & Refuge‘ (pictured above) echoes this by offering enclosure and escape from the outside world. Jake Curley (27) has designed a ‘Business & Pleasure‘ (pictured banner top of page) garden inspired by New York’s rooftops and the High Line. Designed as a functional office space in a natural setting, the garden aims to enhance creativity and happiness throughout the working day. Ula Maria Bujauskaite (24) from Northampton, has designed ‘Studio Unwired‘, (pictured above) an outdoor take on contemporary hot-desking. Ula’s design provides a tranquil and rustic environment, intended to transport workers out of their crowded and conventional offices into earthy, natural surroundings. The city office theme is also reflected in the distinct working spaces which vary between desks and informal seating area. 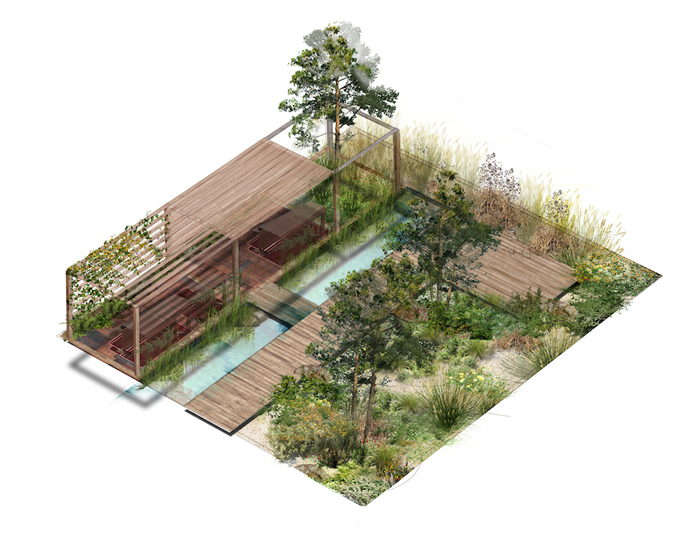 All three finalists have received the benefit of expert mentorship and guidance from award-winning garden designer, Paul Hervey-Brookes: “I am thrilled to be mentoring the RHS Young Designer competition – this competition is highly respected in the industry and has produced some amazing new young talent. This year is no exception and I am excited about the gardens that will be produced,” he said. Paul also points out the RHS Young Designer competition has produced some amazing designs and has kick-started the careers of some talented individuals: “It’s a vital platform for inspiring more young people to get involved in horticulture, which is something that’s really important to the show and to me,” he said. RHS Flower Show Tatton Park has become synonymous with budding new talent with previous finalists going on to design at the RHS Chelsea Flower Show, including Hugo Bugg, Sam Ovens and last year’s winner Caitlin McLaughlin, who worked with multi-award winning designer Sarah Eberle on an exhibit for nursery giant Hilliers at this year’s RHS Chelsea. RHS Flower Show Tatton Park has become a vital launch platform for a variety of young talent in the horticulture industry. Last year saw the launch of the RHS Young Talent competition added to the RHS Young Planting Designer and RHS Landscape Contractor (supported by BALI) competitions, catering for every aspect of horticulture. We wish all the finalists in the Young Designer Competition and the other RHS Competitions running at RHS Flower Show Tatton Park, the best of luck and a successful show.